Why do thrilling adventures rarely make for thrilling movies? As daring undertakings go, Thor Heyerdahl’s 1947 attempt to navigate from South America to Polynesia on a balsa-wood raft ranks with the best (or, for the spoilsports, most foolhardy). 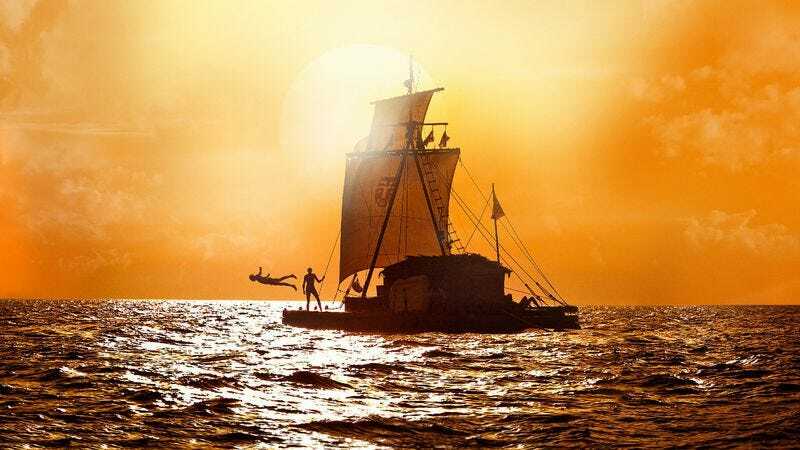 But Kon-Tiki, Joachim Rønning and Espen Sandberg’s modern dramatization, while well-acted and smartly filmed, rarely musters any actual sense of excitement. Real life is the biggest spoiler: Even casual viewers will likely head into the theater knowing Heyerdahl survived his dangerous voyage, whose aim was to prove that Polynesians could have come from South America rather than, as anthropologists then assumed, from Asia. But from the fate of his marriage, which was strained by his enduring obsession, to the stories of his shipmates, plenty of questions are left to be answered. The desperate charisma Pål Sverre Hagen brings to the role of Heyerdahl gives some insight into how he could have convinced a crew to set off on what seemed to most like a fool’s errand. But apart from Anders Baasmo Christiansen, whose beefy refrigerator salesman is the first to sign onto Heyerdahl’s quest, the expedition’s other members coalesce into a lump of tanned skin and salt-matted hair. (The linguistic differences that would have separated Swedes from Norwegians disappear in the English-language version being released in America—not dubbed, but shot concurrently, Dracula style.) When Kon-Tiki wraps up with a roll call that runs down each man’s life, it’s a struggle to recall who is who. The family of the man Christiansen plays has complained about his depiction as a tubby coward (a trope on loan from Game Of Thrones), but Rønning and Sandberg can’t resist the familiar conflict between the airy dreamer and those who would hold him back. (No points for guessing which part his wife plays.) Hagen’s performance suggests Heyerdahl’s determination was based as much on personal need as scientific conviction, but the film glosses over his egoism, retroactively justifying his actions through his eventual success. Although Heyerdahl’s book about the expedition became an international bestseller, and the documentary he directed on the same subject won an Oscar, the anthropology field has remained stubbornly unmoved. But in Kon-Tiki, the dream is all that matters.